The Fikra Tables by Ammar Kalo demonstrate the perfect balance between natural and manmade materials, embracing visual heaviness and experimenting with recycled rubber crumb. Commissioned by Fikra Campus, a multi-use space in Sharjah, United Arab Emirates, that comprises a design studio, a co-working space, a café, a design library and an experimental gallery, each table is designed for a specific use and location within the space. Embracing visual heaviness and experimenting with an unconventional material such as recycled rubber crumb, Ammar Kalo designed a series of tables with a bulbous rubber body which appears to have been sliced in half, revealing a solid white oak interior. The table tops are made of white oak panels and cerused with pink paint, picking up hues from its surroundings. The hovering black masses are delicately balanced by contrasting thin legs which pierce through to the ground. A cross section of the legs can be seen from the table top, nestled in between the tabletop surface and the rubber exterior. These pieces were commissioned by Fikra Campus, which is a design studio, a co-working space, a café, a design library, and an experimental gallery based in Sharjah, United Arab Emirates. Each of the four tables was designed for a specific use and location within the space. Ammar Kalo coats the tabletops with a pink paint ceruse finish that picks up hues from the surroundings. 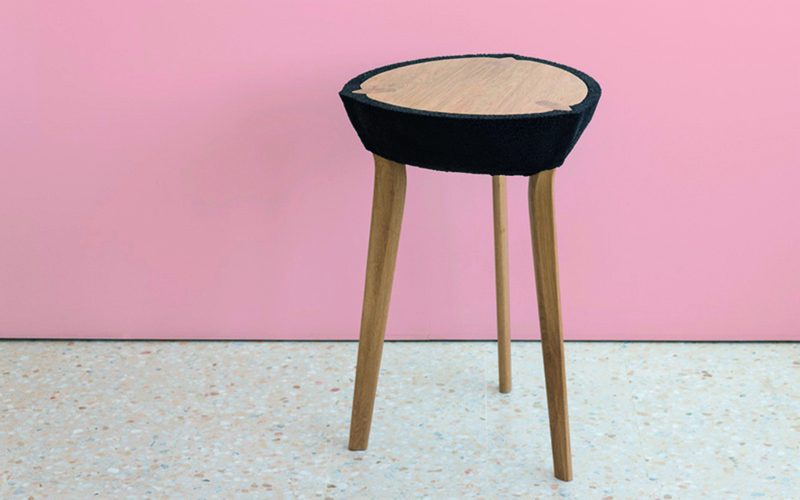 Delicately balancing the dominating presence of the hovering black masses, thin legs are nestled between the tabletop surfaces and the rubber exterior. Ammar previously worked with recycled rubber crumb on the Macaron Seats, a project commissioned by bee’ah, the leading waste management company in the middle east.